CarGurus has 21,005 nationwide Sportage listings starting at $1,795. Where other makers put emphasis on the "utility" in SUV, Kia emphasizes the "sport" with its Sportage crossover. To that end, the 2014 Sportage gets a slightly edgier look with direct-injected engines under the hood good for improved economy and power, and several other upward tweaks—but the Base trim is scrapped, and so goes its stick shift, too. However, now boasting more powerful 4-cylinders than any other compact with usable seating for 5—all larger and pricier, by the way—this Sportage could go all the way. But it does have one significant drawback outside of a sporting emphasis causing it to lose out on some rear legroom and cargo capacity. That is, interior materials. If you don't mind that budget price coming with decidedly budget plastic everywhere, the Sportage promises oodles of fun, especially with its new engine. Previously rated for 176 hp and 168 lb-ft of torque, the move to direct-injected technology for 2014 puts its naturally aspirated offering up to 182 hp and 178 lb-ft of torque. That might not sound like much, but even Chevy's Equinox is consistently rated as surprisingly peppy with its comparatively less-powerful 4-cylinder as of 2014—and the Equinox is a full foot longer and 600 pounds heavier than the Sportage, with a 6-foot wider turning circle to show for it. Even better, this change should help the Sportage's fuel economy leapfrog over the Equinox's, which is presently 20 mpg city/29 highway with all-wheel drive (AWD) or 22/32 with the default front-wheel (FWD) setup. The 2013 Sportage wasn't far off that mark, rated for 20/27 with AWD or 21/30 with FWD. Where the Equinox offers a V6, the Sportage opts to stick with 4 cylinders but in turbo form for its sport-tuned SX. 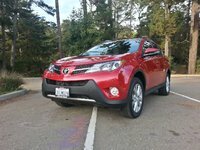 This 2-liter powerplant carries over for 2014, but it didn't need to change, already offering 4 mpg better than the Equinox's technically more powerful V6 with the same distinctly fun character of every other Sportage, just turned up a notch. Also available in both drivetrains and good for 260 hp and 269 lb-ft of torque, this little turbo sips to the tune of 21/28 with FWD or 20/25 with AWD while getting to 60 mph in a mere 6.5 seconds. Other than cosmetics, the rest of this midcycle refresh added the high-performance dampers and tilt-and-telescoping steering wheel standard to the now-base LX, instead of just the mid-level EX and sporting SX, while those 2 upper tiers get a 4.2-inch infotainment touchscreen standard. HID headlights are newly available, otherwise just sweetening the deal with new inclusions in option packs like an On-Star-like telematics suite called "eServices" now included with Kia's UVO and the premium package now adding a ventilated passenger seat. The balance of the 2014 Sportage is exactly as it was for 2013, including just over 26 cubic feet for cargo behind the seats or 54.6 total cubes with the split-folding rear bench totally flat. It's also worth noting that Kia is experimenting with new steering technologies overseas, so if you like your wheels solidly linked, these might be your last few years to get a Kia without any kind of drive-by-wire. 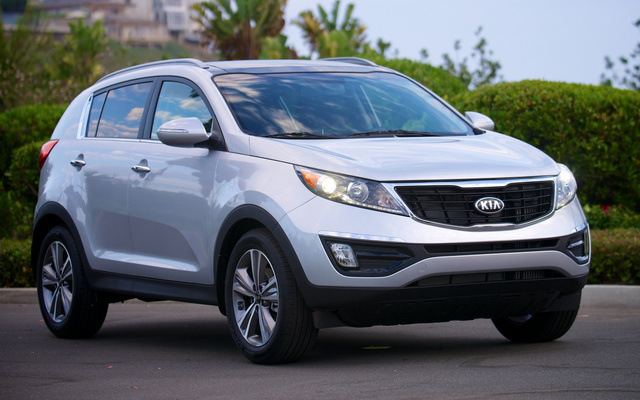 What's your take on the 2014 Kia Sportage? Users ranked 2014 Kia Sportage against other cars which they drove/owned. Each ranking was based on 9 categories. Here is the summary of top rankings. Have you driven a 2014 Kia Sportage? 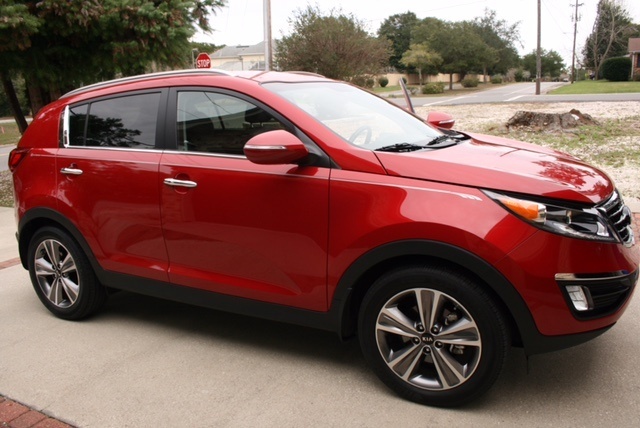 I have a 2014 kia sportage was driving down the road and the car just died. hasn't had any of the maintenance lights come on. Tried to jump it... wont come on at all. What could be the problem? Can I Run A 225 65 R17 On A 2014 Kia Sportage? Can I run a Blizzack ws180 225 65 r17 on a 2014 Kia Sportage? Why didn't my 2014 KIA Sportage dash did not lit up to show low oil.